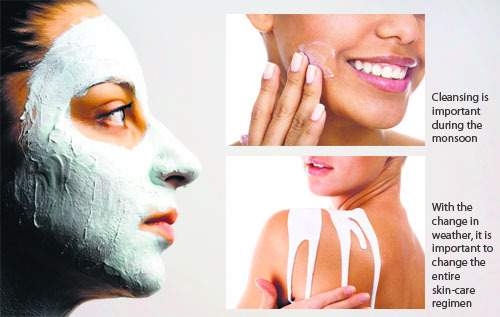 While the rains bring a welcome relief from summer heat, they also pose lot of challenges to the skin. The heat-induced rashes of summer-time give way to the humidity-induced problems of the rainy season. 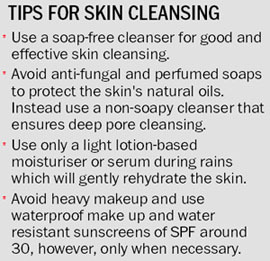 However, if you take few simple precautions, you can save yourself a lot of misery due to skin disorders which tend to rise in rainy season. It is important to change the entire skin care regimen with the change in weather. During the rainy season due to the high humidity in the air, various infectious bacteria, fungi and viruses become active and when these come in contact with vulnerable or even slightly eroded skin these can easily lead to serious skin infections. The few chronic skin disorders like atopic eczema, acne and psoriasis also tend to worsen in this season. The biggest skin complaint during the monsoon is the fungal infection. A fungus thrives in humidity-wet skin folds rubbing against each other get macerated easily, providing easy entry to fungi and yeast. As a result, one develops itchy, circular, reddish, flaky patches on the body, especially in skin folds at the groin (jock itch), underarms and around the breasts in women. Fungal infections can also affect your feet. People walking over wet floors in this season are the most prone to catch fungal infection of the feet. Toe nails then can easily get infected from the adjoining infected skin of the feet and when infected it takes one to two years of regular medication for their complete healing. All important surgeries can get delayed if you have an associated fungal infection. Staying dry is the best way to avoid them. Always keep an extra set of dry clothes and footwear while travelling and change immediately if you've gotten drenched on your way. Once you are seated at your desk, take your shoes and socks off to allow air circulation around your feet for few minutes at least once a day. Wear sandals or floaters as far as possible. Use anti-fungal dusting talc to prevent accumulation of sweat and moisture in skin folds. Those prone to repeated fungal infections can use medicated powders. Athlete's Foot is a combined bacterial and fungal infection that affects people whose feet stay wet for hours, especially after exposure to dirty water. Starting from the toes, the skin turns whitish or green, itches terribly and there may even be a foul-smelling discharge or pus. Prevent this by thoroughly washing your feet with soap and hot water after wading through stagnant water and then dry them completely. Avoid wearing boots as these would hold water for a longer duration, creating a soggy environment for your feet. During monsoons, nails can get discoloured, brittle and rough. You may also notice red, swollen and itchy skin around them. Always keep your toe-nails short, so that dirt cannot enter them. Be extra careful as to not injure your nail folds with excessive nail chipping. When you go for pedicure, ensure that the instruments used are sterilised/ cleansed with disinfectants and avoid getting the cuticles pushed too much as toe nail fungal infections are very common in monsoons. Skin of children is most vulnerable during the rains. Impetigo is one of the most common skin infections in children commonly encountered during this season. It causes red sores that can break open, ooze fluid, and develop a yellow-brown crust. These sores can occur anywhere on the body but most often appear around the mouth and nose. Impetigo is contagious and can spread to others through close contact or by sharing towels, sheets, clothing, toys, or other items. Always get them treated from a dermatologist at the earliest sign before these become widespread. Scabies is another common infection that preys on both children and adults during the monsoon — it is caused by a mite infestation. If your child complains about a body itch that intensifies at night and you see a few red bumps or a rash on his/her hands, wrists, underarms, abdomen, groin and buttocks, then rush to the dermatologist - this condition is highly contagious and invariably spreads to the family if not treated properly. Viral skin infections in form of verrucae (warts) also tend to increase in the rainy season and they have to removed with a laser otherwise can spread rapidly to other parts of body including face. Sickly, dull, oily-looking skin is common during the rainy season. Nondescript itching also occurs occasionally. Cleansing is important during the monsoons. The high humidity can cause sweat to run in rivulets over the skin. This creates a build-up of dirt, dust and grime along with other toxins on the surface of the skin. Remember to nourish the skin from the inside too — include vitamin E and omega 3 in your diet. These nutrients will keep the skin nourished. It is advisable to take vitamin C during the monsoons to boost your resistance against infections. Eat salads blanched in boiling water and drink the usual 8-10 glasses of water.